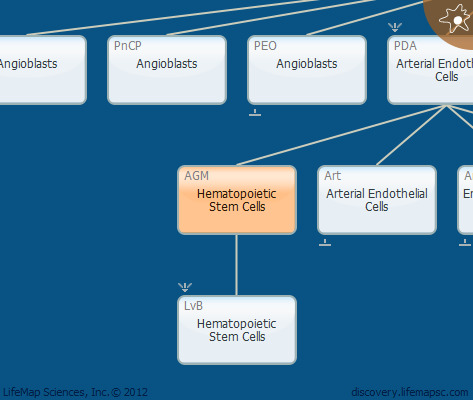 Hematopoietic stem cells (HSC), which are generated within the aorta-gonad-mesonephros (AGM) region, are multipotent, myelo-lymphoid stem cell. These cells serve as a definitive source for hematopoietic cells that migrate and colonize the fetal liver (liver bud) at ~E10. Although controversy exists regarding the identity of the ancestor cell, there is evidence that these cells bud from endothelial cells of the ventral wall of the dorsal aorta. In humans, HSC clusters are present at the AGM during days 27-40 days of gestation.